1. Steel Supports — 3 by 3 by 1/4 in. angles attached at top and bottom with 2 in. long, 3/8 in. diam fasteners 24 in. OC. 2. Steel Flashings — No. 19 MSG galv steel. Side flashings on liner side are 2 by 3 in. angles. Side and top flashings on facing unit side are 1-1/2 by 1-1/2 in. angles. Bottom flashing on facing unit side is a 3-7/8 by 2-11/16 in. angle. Flashings attached 24 in. OC to liners and facing units with No. 14 by 7/8 in. long hex-washer-head self-tapping steel screws. Flashings attached to adjoining walls, floors and ceilings with No. 14 by 1 in. long steel screws or bolts spaced 24 in. OC. Bottom facing unit flashing may be secured to wall by the fasteners securing the bottom sub-girt. 3. Wall and Partition Facings and Accessories*— Steel Liner Units — Min 24 MSG, nom 12 in. wide by 1-1/2 in. deep. Attached to top and bottom angles with No. 14 by 1 in. long hex-washer-head self-tapping steel screws, 12 in. OC. MORIN CORP — Types L-12-0, L-12-1F, L-12W-1, and L-12-2F. 4. Reinforcing Channel — (Not Shown) — No. 19 MSG galv steel channel 1-1/2 in. deep, with 1 and 3 in. legs. Used to support free end of last liner unit installed. 1 in. leg attached to liner with the screws securing the flashing angle to the liner units. 5. Batts and Blankets* — Nom 12 by 48 by 1-1/2. 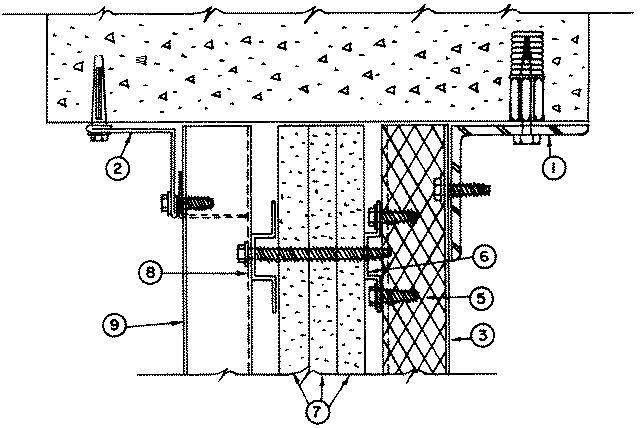 Inserted in liner cavity with end joints occurring at sub-girts. 6. Sub-girts — Hat-shaped, 1/2 in. deep, 1-3/8 in. min width, 1/4 in. min leg width, 20 MSG galv steel. Attached along both legs to lips of liner units and to reinforcing channel with No. 14 by 1 in. long hex-washer-head self-tapping steel screws. Spaced 48 in. OC and 3 in. 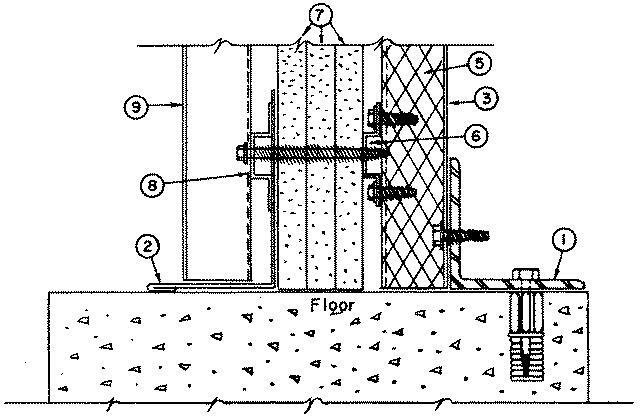 from top and bottom of wall, or when steel studs are used, attached to legs of studs along both sub-girt legs with No. 14 by 7/8 in. long hex-washer-head, self-tapping, self-drilling steel screws. 7. Gypsum Board* — Any 5/8 in. thick UL Classified Gypsum Board that is eligible for use in Design Nos. L501, G512 or U305. (Three layers) Nom 5/8 in. thick by 48 in. wide sheets applied vertically. Joints between adjacent layers staggered 12 in. vertically and 48 in. horizontally. Horizontal joints to occur at sub-girts. First and second layers attached to each sub-girt with 0.114 in. diam, 1-5/8 in. long bugle-head self-drilling steel screws located 12 in. from vertical joints and 1/2 in. from horizontal joints. Third layer attached to first and second layers with 0.13 in. diam. 1-1/2 in. long phillips-head steel wallboard screws spaced 12 in. OC vertically, located 12 in. from vertical joints and 1/2 in. from horizontal joints. 7A. Gypsum Board* — (As an alternate to Item 7) — Nominal 5/8 in. thick, 4 ft wide panels, secured as described in Item 7. 7B. Wall and Partition Facings and Accessories* — (As an alternate to Items 7 and 7A) — Composite Gypsum Panel — Nominal 5/8 in. thick, 4 ft wide panels, secured as described in Item 7. 8. Sub-girts — Same as Item 6. Located in line with the sub-girts on the opposite side and attached through the wallboard to first set of sub-girts with No. 14 by 3 in. long hex-washer-head self-tapping steel screws spaced 24 in. OC. 9. Wall and Partition Facings and Accessories*— Steel Facing Units — Min 24 MSG, nom 12 to 36 in. wide. Extended lip attached to sub-girts with No. 14 by 7/8 in. long hex-washer-head self-tapping steel screws. The last unit installed is attached to a reinforcing channel with the same screws securing the flashing angle to the facing units. 10. Reinforcing Channel — (Not shown) — No. 19 MSG steel channel 1-1/2 in. deep, with 1-1/16 and 2-1/8 in. legs. Used to support the free end of last facing unit installed. Long leg attached to sub-girts with No. 14 by 7/8 in. long hex-washer-head self-tapping steel screws. 11. Steel Studs — (Not Shown) — Optional — min 3-5/8 in. deep with min 1-1/2 in. legs. No. 18MSG min prime painted steel attached at liner joints to each liner with No. 14 by 7/8 in. long hex-washer head self-tapping, self-drilling steel screws spaced vertically 12 in. OC.